The fact that I am swamped by the too many activities I am involved in these days can be gauged by things like the following: I get to know about important new physics results coming from an experiment I am part of by... private communications from amateurs! Knowledgeable and informed ones, of course -but that's not the point. So the news I got from Tony Smith today is that the jet-jet resonance unearthed by CDF in W+jets events, the one which made everybody cry Higgs just one more time about two months ago, is still there once data a significant amount of new data (three more inverse femtobarns, i.e. an additional 70%) is added to the analysis. The result which was shown by Giovanni Punzi at the "Rencontres de Blois" last week is now based on a total of 7.3 inverse femtobarns of proton-antiproton collisions collected by CDF in Run II. The added data confirm the presence of a suspicious, quite suggestive hump in the otherwise falling mass distribution of pair of jets produced in association with a W boson, as shown below. The left panel shows the mass distribution, with data (black points) compared to contributing processes (see legend for details). The right panels shows the excess data with respect to all background processes -i.e. W+jets, top, Z+jets, and QCD. The WW/WZ signal is prominent, but the additional excess at about 150 GeV of mass is unexplained, unless one marries the hypothesis that a new huge resonance (in blue) is contributing. If you are new to the analysis which produced the figure above, I will summarize it in as few words as I can. 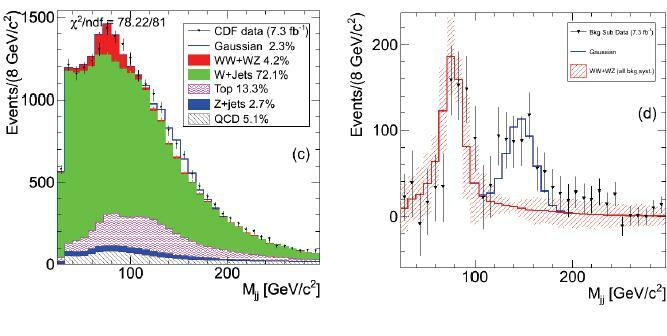 CDF was searching for semileptonic WW/WZ production, by identifying a leptonic W boson -i.e. one decaying to an electron-neutrino or muon-neutrino pair- and then picking the two most energetic jets produced in association with that particle, tuning the selection cuts in order to evidence the small signal of a W->jj or Z->jj resonance. This game can be played despite the small signal-to-noise ratio of WW/WZ production with respect to the W+jets QCD background, provided that the dataset is large and that one has a good description of the kinematics of background processes. The authors found the WW/WZ signal, but noticed that the background shape at higher masses was poorly described by their model. They realized that a Gaussian signal lying on top of all backgrounds could explain the feature away, and proceeded to study the effect. They could not explain away the observed feature by known systematic sources (such as jet energy scale -the obvious suspect- or other details of background modeling). So they set out to publish the effect as a hint of a new particle signal. That the effect was not a statistical fluke but a systematic effect was quite evident from the beginning, so the fact that the added data now confirms the earlier observation, adding units of discrepancy to the original significance, is absolutely not a surprise. What I am surprised about is that CDF produces the updated spectrum but does not provide more comments than those present in Punzi's slide above. In other words, CDF is still investigating, but in the meantime they "confirm" the previous effect. What should the end user conclude ? Is this the Higgs ? Time will tell, but not CDF time -if CDF just updates the result by throwing in more data, little is learnt. Instead, the other players will come in and show whether they also see a hump at 145 GeV. DZERO, ATLAS, and CMS all have already collected datasets large enough to prove or disprove the CDF effect. Note, however, that if the mismodeling is coming from a Monte Carlo simulation, and if all experiments use the same, they are likely to also see an effect! That is why I hope that more time will be spent on understanding how reliable are the simulations in reproducing the kinematics of jet radiation accompanying vector boson production. Let us look at Z+jets, gamma plus jets, 1,2,3 and more jets. Let us check the delta R distributions; let us verify how good an agreement we have in those spectra. I have seen little of this -but it might be that, as I noted at the start of this post, I am distracted by other things!